Kings Canyon National Park lies at the center of a 140 mile section of the Sierra Nevada mountains that has no through east-west roads. 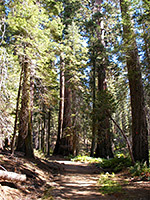 The one route into the park (CA 180 from Fresno) first passes through the separate Grant Grove section that contains several groves of giant sequoia, surrounded by regular forests of lodgepole pine. 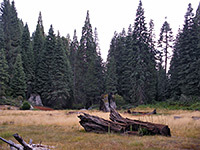 This area was once designated the General Grant National Park, but became part of the newly created Kings Canyon National Park in 1940, and today has many visitor services including campgrounds, a network of long and short hiking trails, several shops, a restaurant, and log cabin accommodations. The approach to Grant Grove from the west is along a good, wide road (Highway 180) that climbs steadily without any sharp curves or especially steep sections, starting in the chaparral-covered Sierra Nevada foothills at 2,000 feet, entering pine forest around 4,000 feet and reaching the park boundary at 6,000 feet, soon after passing the first sequoia which grow either side of the road around what used to be the official entrance station, though this was moved recently owing to unstable trees nearby. Now visitors pay the $20 park fee at a booth half a mile further, next to a small parking area used for the 2 mile Big Stump Trail - one of the best places in the park to view sequoia, this path also encounters huge logs, tree stumps and great piles of sawdust left over from timber operations at the end of the 19th century. 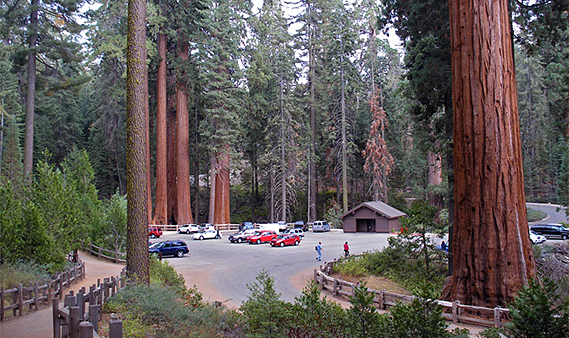 Beyond the ranger station, the road soon divides; the left fork leads to Grant Grove and eventually Kings Canyon while right is the start of the famed Generals Highway (CA 198), that crosses very scenic, hilly land en route Sequoia National Park, reaching Giant Forest Village after 29 miles. Still within the Grant Grove district, the road passes trailheads for the easy hikes to two granite summits - Buena Vista Peak and Big Baldy, both having fine views of the surrounding mountains, and of nearby Redwood Canyon. This steep-sided valley contains the most extensive group of sequoia in the area though as this is accessible only by a rather longer, steeper trail, few people visit so the place is very peaceful and unspoilt. By far the most popular group of giant sequoia is at Grant Grove, reached by a short side road starting 1.7 miles north of the CA 180 - CA 198 junction. From the carpark, nestled right amongst the big trees, a self-guiding, 1/3 mile paved loop path winds through the nearby grove, past two dozen or so particularly large sequoia, many named after US states. Perhaps the most famous is 1,700 year old, 266 foot high General Grant, the third largest sequoia in the world and also both the Nation's Christmas Tree and a National Shrine. 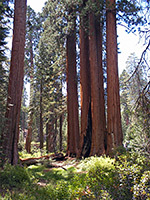 Another notable sequoia is the Fallen Monarch, the 124 foot long trunk of a tree that toppled many centuries ago and is now hollow owing to a combination of fire damage and natural decay; a path runs through the whole length of the trunk. The main Grant Grove loop is usually quite busy though several side paths branch off and lead to quieter places in the forest, away from all the crowds. Even more peaceful is the North Grove, reached by a 1.5 mile loop trail along old logging tracks, that starts at the far end of the carpark, by the RV/bus section. This descends steadily across quite open hillsides, past a few large old trees (though not quite as tall as those at Grant Grove), many younger specimens and several huge old stumps; also en route is a pretty, fern-lined spring feeding a small stream. Basic services are provided by Grant Grove Village, a collection of rustic shops and residences on the east side of Hwy 180, surrounded by thick forest. 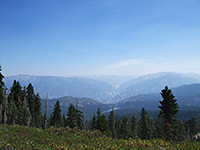 The one road through the village continues 2 miles up a steep hillside to Panoramic Point, an excellent overlook of Kings Canyon and the surrounding peaks of the Great Western Divide. From the viewpoint the 2.5 mile Park Ridge Trail leads southwards across sparsely wooded hillsides to a fire lookout station, which has views of the high Sierra and of Central Valley.